As we all know, there is a confusion about tenting vias and plugged vias when placing your PCB order, many customers and designers get into trouble in learning which one is better. Now PCBGOGO will make an introduction for you. 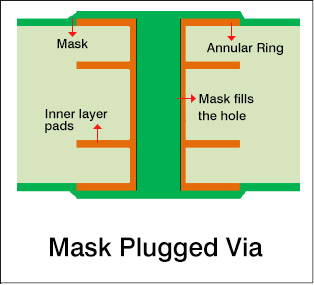 It’s the most popular and mature process in PCB fabrication, and tenting vias mean to cover the annular ring and via hole with solder mask, which is mainly in covering the annular ring to prevent exposure to the elements and reduce accidental shorting or contact with the the circuit. No special steps are taken to ensure the hole opening remains closed. 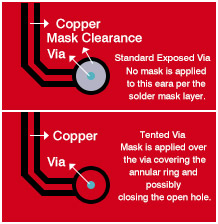 Sometimes tenting vias will lead to the hole remaining covered but there is no guarantee, and smaller diameter vias (12mil diameter or less) have the best chance of remaining closed. However it will make an effect on the PCB fabrication process if there is not solder mask ink in the vias. Tips: If you make use of the tenting vias in your design, do a fabrication note either in a readme.txt file or Gerber fab drawing so that we can know you have intention to remove the mask clearances from some of your vias. Otherwise we may place the order on an engineering hold to verify your intention. Plugged hole is a process in PCB fabrication, which filled with ink in the vias, not solder ball and white light, as a matter of principle the diameter vias( 0.5mm or less) have the demands of the plugged vias. Plugged vias, taking specific measures to ensure the via is plugged and sealed with mask and the annular ring is covered, and it can solve the problem of being yellowing of the aperture but the tenting vias can’t do, however the cost is excessively high. Plugged hole is mainly in a BGA design where vias are usually found in very close proximity to the BGA’s SMD pads. What should it concern is that solder will far away from the intended pad and flow down the via creating poor or non-existent solder joints during assembly. 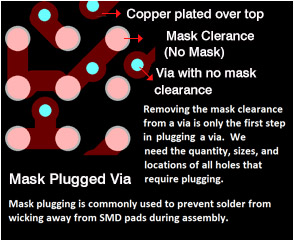 Tips: If you require mask plugged vias, it needs to be specified in your fabrication print or readme.txt file. There are some things you need to know,such as quantity, sizes and locations of the vias to be plugged, so that we can be sure that we plug all the required holes. Via in pad, the annular ring of via is exposing with HAL( such as the components pad exposes), it is without any treatment in PCB fabrication. However now via in pad is more and more normal with BGA packages are becoming tighter. 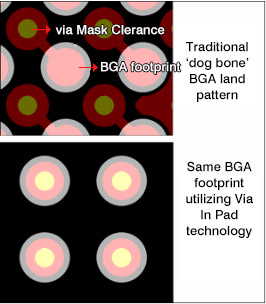 And not using the standard “dog bone” land pattern to transfer signal from the BGA footprint to a via that passes signal to other layers, vias can be drilled directly into the BGA footprint pads. This allows much simpler routing by soldering directly over the via. Make sure this process is called out in your fab notes. Via in pad is usually used for testing the signal, but it’s easy to result in the short. Tip : We need to know the location, quantity and size of the holes that need to be via in pad. There is mainly in via, plug hole, and connection between protel/pad and gerber files. it’s easy to make a mistake when learning with via, plug hole and pad. 1、Via will lead to the problem when getting into involved in wrong design or the designer have no idea about transferring gerber rules in the transfer process. When it is the gerber files, manufacturer have no idea which are via and plug hole, however, where there is paste mask,where is pad, and manufacturing based on files.The dispute is: the tenting vias is what I need, but you do the pad, it may result in the short. So the manufacturer can’t check what is via or plug hole because the gerber is film file, and whether the gerber file has solder mask or not, if solder mask is being, it will do the tenting vias, otherwise is pad. 2、It’s easy to get into trouble in mixing the pad and via . It needs to be tenting vias sending to the manufacturer as file is pads or protel, but pay attention to check carefully whether the pad is with via or not, otherwise it won’t solder as soldering mask on the pad. The dispute is: why is tenting vias because it needs to be HAL on the plug hole. So please firstly check the files which is using under the same condition? Layout with pad or via ? 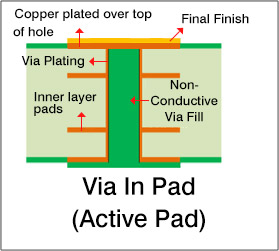 There are a lot of customers using the pad to be via, and lead to the problem of via pad when the files is pads or protel, the demands of order is tenting vias. Maybe the tenting vias is what you need, the depute is coming into being : why is pad, but tenting vias is what I need. So checking whether the file layout is normal or not. So we make a explain for vias and pad, if it’s the via, please treat based on the via, but it’s the pad, doing with the pad. Because nobody knows which is via, which is plug hole, so please know that the unique identification is via and pad. 3、How to design the tenting vias on the protel or pads? 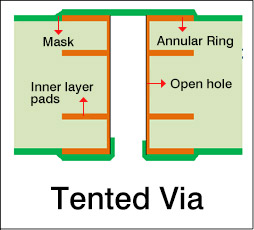 Via has the option of tenting in the protel, if ticking the tenting off, it must the tenting vias, so it’s the tenting vias for gerber file; and pad to file is taking the ways of tenting vias in pads: when the exporting is solder mask, ticking solder mask top off--the via, it is total via in pad, if not ticking the tenting vias. In a word, doing based on the pad, if it’s the pad, because its nature is plug hole; there are two choices for via, you can choose the via as placing your PCB order, if it’s the original file, and if it’s the gerber file, pay attention to check whether gerber file is meeting your demands or not.